What Is the History of “Putting a Child Up” for Adoption? The world of adoption has changed dramatically since the mid-1800s, but the language we use has not, for some reason. Imagine back to a time in history when children were forced onto trains, where they would ride across the country, stopping in city after city, and be “put up”—usually on stages or tall stumps—at auctions to perform for and be inspected by prospective adoptive families. Today’s adoptions look nothing like this, yet many still use the phrase “putting a baby up for adoption,” though children today aren’t “put up” on anything. Today, expectant parents make the choice of adoption for a variety of reasons, but they choose their baby’s parents—their children are never put up for auction. Our children are not forced onto trains, separated from their families of origin, and given to families for the sole purpose of doing hard labor. Children today have careful adoption plans made for them by their birth families, and adoptions are often open, meaning children and birth parents always have access to one another, never denying children much-needed access to their roots. 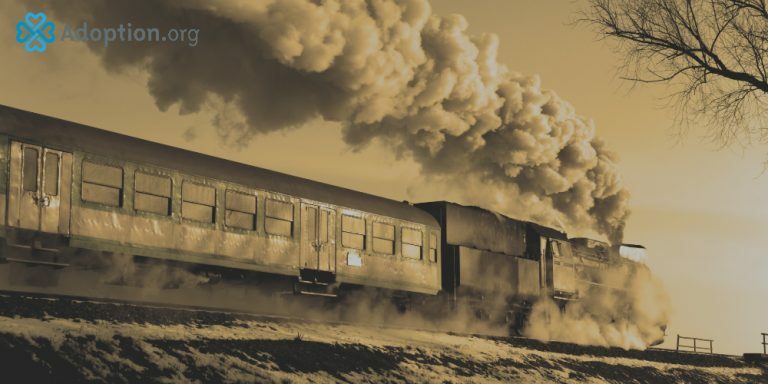 The history behind being “put up” for adoption begins with the orphan trains that ran from the mid-1800s until the early 1900s. During this time, eastern cities were overrun with young orphans, and there were nearly 30,000 homeless, abandoned, neglected, and orphaned in New York City alone in 1850. Children found themselves in this predicament for a host of reasons. Some were abandoned by parents who were addicted or unfit. Others were left orphaned because so many people were wiped out by illness that moved through the country during that time. A man named Charles Loring Brace believed he knew the answer to the problem of having so many unattended children. Many of the children had turned to a life of crime to survive, and it caused quite a problem in New York City. As a founder of the Children’s Aid Society, Brace had many ideas, but they all centered on a need for children to have a stable family and engage in hard labor. He knew these children needed to turn their lives around, and the city needed help from the theft and violence that resulted from having so many children left to themselves. To meet these needs, the orphan trains were created. Between the years of 1853 and 1929, around 200,000 abandoned, orphaned, or homeless children were relocated on trains. They stopped at predetermined locations throughout the rural Midwest, and they were all adopted by families who needed help with manual labor. Brace believed that exposure to hard work and a structured lifestyle was the only chance these children had of breaking the cycle of crime and poverty, and he thus truly believed he was doing these children a favor. The Midwest was quickly expanding, and labor was needed. So Brace slept well at night, thinking he had killed two birds with one stone. Brace did not believe in social services, saying the handouts they provided only fed the poor; they did not fix the root of the problem, which was that children needed hard work and structure in order to break the cycle. Brace believed in reform and taking action when problems were noted. The orphan trains were his way of doing just that. It was his intention that strict standards be put into place and that adopted children—despite being adopted to provide labor—be treated equally to biological children. He implemented a rigid standard for the families who were allowed to adopt, and he tried to implement a system where these children were checked up on. But the system often failed, and many children lived a nightmare because of the fate Brace had left them in. Other times, children were adopted for the same reason we adopt today: Families wanted more children to love. The youngest generation of orphan train riders are alive today; many report having wonderful lives, while others have horrific tales to tell. Before an orphan train arrived in a city, advertisements were sent out, and families waited for them to arrive. Some children were even matched with families before the trains arrived in that city. As the trains pulled into the station, people interested in adopting the children would line up. At some of the nicer stops, children were ushered into a theater, opera house, town hall, or school, and put up on a stage to perform, recite poems, or sing for the prospective adoptive families. At some of the worst stops, children were put up on stumps or blocks for invasive inspection. It’s hard to say what the saddest part of the history of orphan trains really was. Perhaps it’s the children who might have fared better had they been left to their own devices, turning to a life of crime in some of New York City’s most disease-ridden areas. Maybe it’s the siblings who were separated, wanting to stay connected to the only family they had, living with vague memories. But surely it’s all the children who were taken so far away from their families that their beginnings were left completely unknown to them. They had to forever wonder where and whom they came from, never having answers to any of their questions.